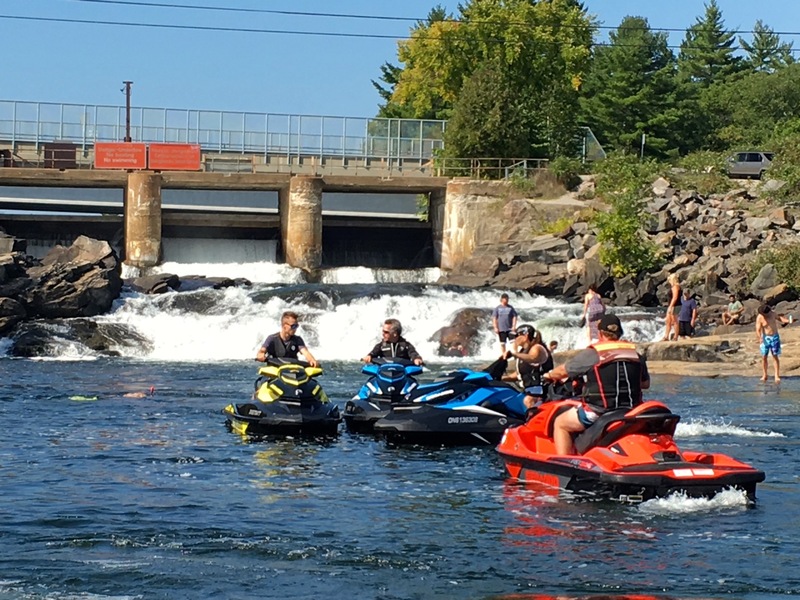 If you’re looking for a great destination to end your Ontario Sea Doo riding season, you won’t do any better than this Muskoka fall sea doo tour. Boat traffic’s way down after Labour Day and there’s plenty of colour along the rugged Canadian Shield shoreline – even before the leaves start turning. Best of all, there’s a pile of interconnected lakes and rivers to discover throughout the region. So if you want the most memorable season finale possible, plan a three-day exploration on some of Muskoka’s best waterways, staging out of The Residence Inn by Marriott in Gravenhurst. 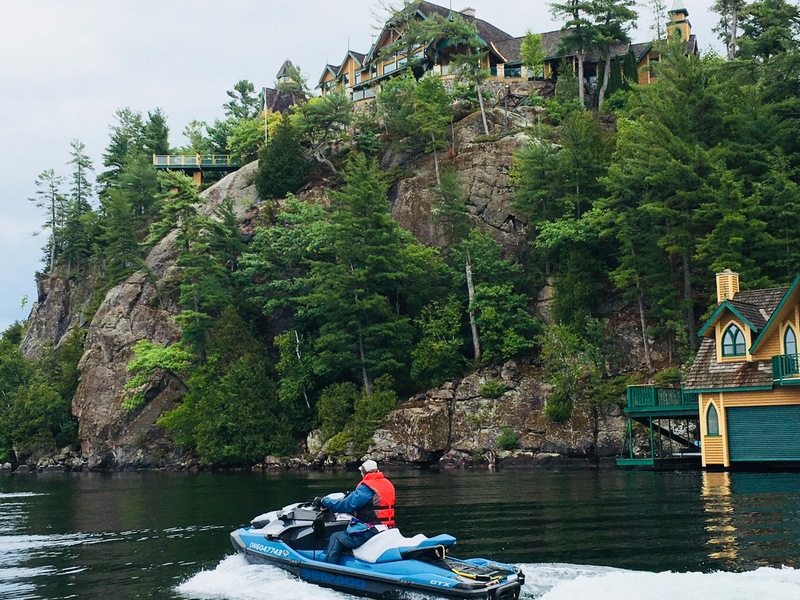 This first class hotel is perfect for staging Sea Doo tours. It’s located right beside the public launch, docks and parking at Muskoka Wharf. You can also rent a Sea Doo watercraft on site or dine along the scenic boardwalk. Best of all, The Residence Inn is centrally located for easy and convenient access to these three terrific rides! From The Residence Inn, we trailered 30 minutes north to Huntsville for our day one Muskoka fall Sea Do tour. Launching around 10:30 AM from Avery Beach Park, we spent a leisurely 5-hour day exploring the connected waters of Lake Vernon, Fairy Lake & Peninsula Lake. Unfortunately, there’s no water connection to the larger Lake of Bays. We lunched on the Huntsville waterfront, where both Boston Pizza and On The Docks Pub offer good docks and eats. We were able to complete this ride on one tank of fuel, filling up at a roadside gas station while trailering to Huntsville and on the way back after our ride. What’s Neat About This Ride: Cruising the historic canal between Peninsula and Fairy Lakes. Touring on the river through the Town of Huntsville. Fall Ride Caution: Although there is one marina on Lake Vernon and a gas stop on the river through Huntsville, check fall hours beforehand. For more detail: Check out my Huntsville Area Sea Doo Tour article. Day two of our Muskoka fall Sea Doo tour, we simply backed our trailers down the Muskoka Wharf boat ramp in front of the Residence Inn. From there, we headed out onto Lake Muskoka at 9:30-ish. 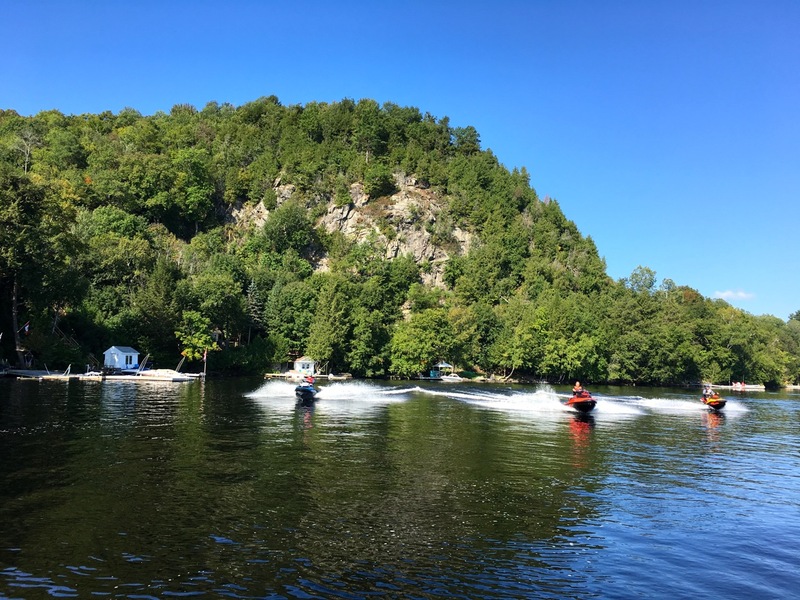 Over the next eight hours, our Sea Doo watercraft carried us through the locks at Port Carling to circumnavigate Lake Rousseau and Lake Joseph. We stopped for lunch and gas at Gordon Bay Marine and its deliciously must-visit dockside eatery, Lakeside Gordon Bay. What’s Neat About This Ride: Eye candy ‘cottages’ considerably ups the wow factor, especially at the north end of Lake Joseph. Fall Ride Caution: Confirm operation hours at Port Carling lock beforehand. 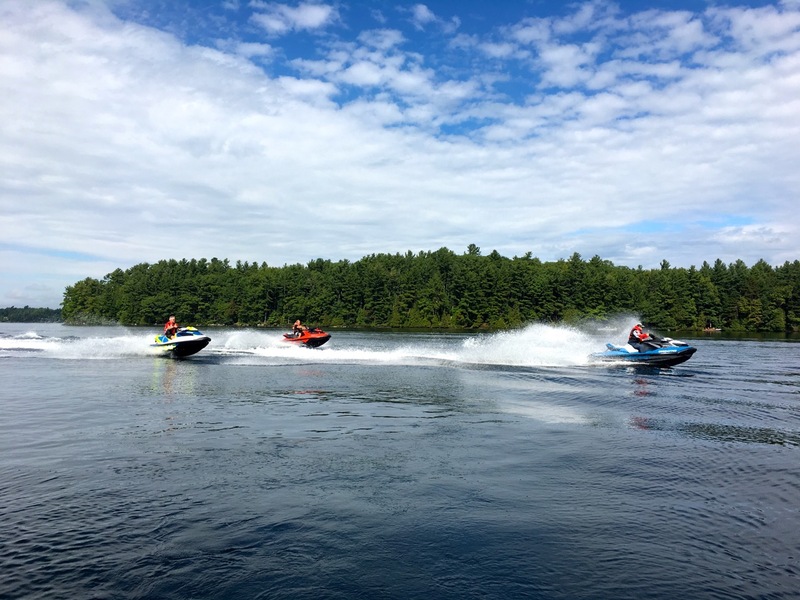 For more detail: Check out my Muskoka Sea Doo Ride Planner article. 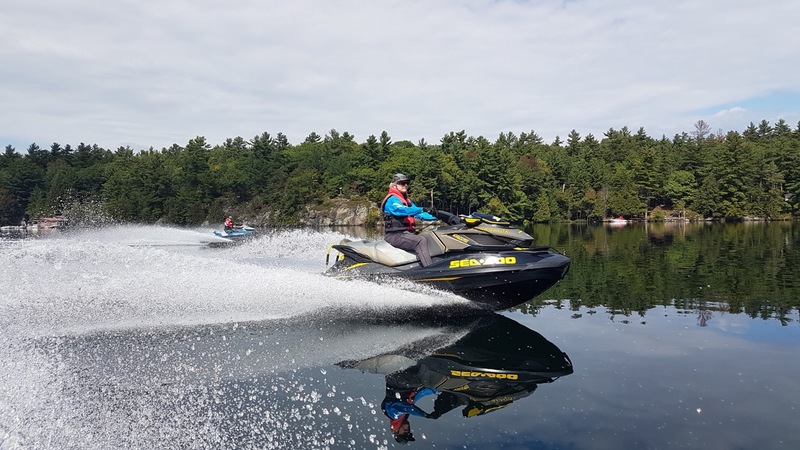 For the final day of our Muskoka fall Sea Doo tour took us about a 15-minute trailer drive south from Gravenhurst to Sparrow Lake. After launching at Franklin Park at 8:30 AM, we cruised for the next eight hours or so west along on the Severn River portion of the Trent Severn Waterway to Port Severn. Then on to Honey Harbour on Georgian Bay. Here, we fuelled at Nautilus Marina and chowed down at its on site restaurant before embarking on our return trip to reach the Swift Rapids lock before it closed at 4:30 PM. What’s Neat About This Ride: The Big Chute Marine Railway is the star of this show, but the huge Swift Rapids lock is no slouch either. Fall Ride Caution: This ride includes two locks and the marine railway (there and back), so plan ahead to take into account shorter fall operating hours in effect for the entire Trent Sever Waterway. For more detail: Check out my Severn River Georgian Bay Ride article. 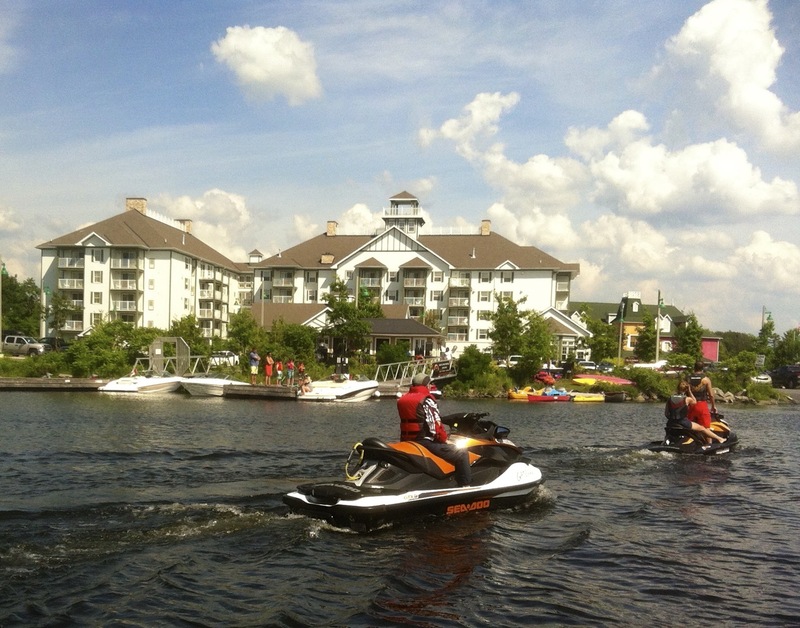 Staying at and staging from The Residence Inn by Marriott Gravenhurst made our Muskoka fall Sea Doo tour extra special. It’s ideal for couples looking to share a super lodging experience as part of a great tour. The premier suites at The Residence Inn are classy and spacious, with separate bedrooms (each with its own bathroom) and living room. The full kitchen and dining area enables you to make your own dinner, either in room or using an available outdoor BBQ. Or to order in from local restaurants that deliver. A full hot breakfast is complimentary for hotel guests, as is access to the indoor pool and hot tub, 24-hour gym and handy on site convenience store. As I’ve already inferred, fall riding requires some advance planning. Summer hours of operation end at both locks and marinas as of Labour Day. Some summer gas stops may even close for the season from that day on. So you want to adjust your ride distance and timing so that you can fill up wherever gas is available. Also, make sure that your ride duration allows ample time to pass thru the last lock on your route before closing time. Finally, temperatures may vary considerably from being quite chilly at the time of an early morning start to being downright hot by late afternoon. So dress accordingly with storage space available to store extra gear that may be needed at certain times but not others. But don’t let these changes of the season keep you off the water. Autumn is an amazing time to extend your personal watercraft riding season. It’s also a unique opportunity to discover a quieter, calmer Muskoka.